Happy Tuesday! Hope your week is off to a great start! I added little pops of neon to this outfit to give it a little color! Don't forget to enter the $100 dollar Nordstrom giveaway below! I love neon all year round! This necklace is amazing. Obsessed as usual. You hit the nail on the head! Love the necklace and the pants! I love neon and am so glad to see you still rocking it into fall. Your printed pants are awesome! Thank you! I love my fall colors, but I also love color! Thank you! They were a great deal at J.Crew Factory. 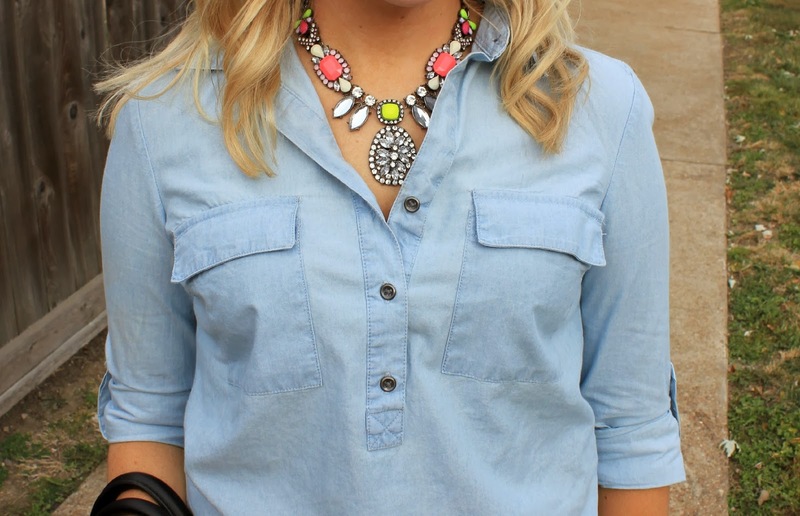 I absolutely LOVE that neon statement necklace, gorg! Rocking it out here lady!! Loving the outfit.. I'm digging how you're working neon into fall looks- brilliant! Love it! That necklace is gorgeous, and I love the touches of neon. You look fab! Thanks Nikki! You are always so sweet! Love how accessories can change the whole look! Me too! Adding accessories is always fun! I love these pants with the chambray shirt! I never thought of doing that. I have a similar print from JJill that would look great! Love the pink accents! Hate this muggy MO weather! Got into wearing my boots and sweaters, want to go back. I know we'll get the chance. Today is gorgeous! I have a half day at work and I am going to use it to spend time outside! Love the pops of neon with this outfit! You look gorgeous! I like the way the cambray is paired with the wild jeans- they really balance each other out and allows the jewelry to shine too. Grogeous necklace! And I really like the chambray with the print pants.